1. 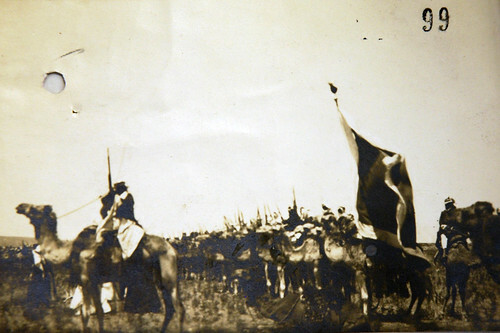 A photo (probably) by the British Consul in Damascus, C. E. S. Palmer, of the Ruwallah «Bairak» (fighting troops) taken in 1923. The photo is an attachment to a report Palmer wrote to the Foreign Secretary the same year after visiting the Ruwallah tribe. Copy for Foreign Office only, please. The Flag marks about half-way along the line. I fancy this is the only photo of the «Bairak» in [revere?] order ever obtained by a Britisher. 2. An extract of a handwritten letter from the Sultan of Nejd, Ibn Saud, to the British Agent in Jeddah, Hejaz, written in June 1925 during the war between Hejaz and Nejd, 1924-1925. The letter is dated June 16th and arrived in Jeddah June 30th. 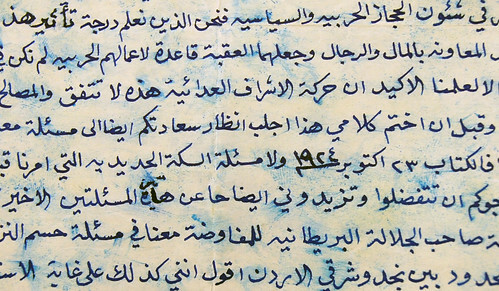 The letter was a part of a correspondence between Ibn Saud and Britain. In the letter he informs Britain that he has ordered a halt to the attack on the disputed area of Akaba. He also complains about the intrigues of Sharif Hussein and his son Abdullah, the Emir of Transjordan, who uses Akaba as a base. He also informs that he is willing to renegotiate a frontier settlement between him, Transjordan and Iraq. The former negotiations, the Kuwait Conference, were canceled when Ibn Saud invaded Hejaz in the summer of 1924.